WHY STAY ANYWHERE ELSE IN HILO BUT CLOSE TO BEACHES AND THE OCEAN WHERE THE WEATHER AND SNORKELING IS BEST!! Our three bedroom beach house and studio were given the name Hale Nani Ma Ka Lihi Kai which means, "Beautiful Home at the Ocean’s Edge". It was given by Kumu Hula's (teacher of hula) who visits us every year. They bring their Halau (school of dancers and musicians) to Hilo every year to compete in the World Famous Merrie Monarch Hula Festival. Our remodeled Kama'aina two story three bedroom beach house and adjoining studio is very popular with multiple families who want to vacation together but have individual units for private times. There is also a large outdoor gazebo for grilling and dining. Families enjoy their evenings here while dining and listening to the ocean. The upstairs and studio units offer AC. The downstairs unit does not have AC but is very cool throughout the day and evenings. All units have ceiling fans throughout. Each unit has its own patio and there is a large shared outdoor patio with seating and a grill. There are ocean and garden views from the upstairs patio and front porch and it is only a few steps to beaches, tide pools, and ocean shoreline. The upstairs beach house provides a full kitchen and bathroom, one bedroom, two living areas (one with a queen size futon sofa bed) and a large patio overlooking a pond and garden. Although, there are ceiling fans throughout, air conditioning is also available for those warm tropical nights. The downstairs provides a kitchen area with microwave, refrigerator and other small appliances, a living room and dining room area, full bath with shower, small and large outdoor patios, and bedrooms one with a full size bed and the other a queen bed. A walkway connects the studio unit with a full kitchen, living and dining area, and shower bath. This air conditioned unit also provides a queen size bed and full size futon sofa bed. There are cable TV's through out the living and bedrooms with large screen TV's in the living areas. Our vacation rental located in the heart of Hilo and along the ocean drive is ideal for visitors looking to visit all sites on the east side of the island. The home is 5 minutes from the airport, shopping, restaurants, gardens, fish markets, and Hilo’s popular Downtown Farmer's Market. The Hawaii Volcano National Park, Waterfalls along the Hamakua coast, and Rainforest ziplines are about a 20-30 minute drive away. The world famous Arnotts’ Tours that include, Volcano, Mauna Kea Star Gazing, and other famous tours is less than a five minute walk from our home. Come and be close to everything Hilo has to offer. Local Kamaaina family that grew up and lived in Hawaii for generations. The property has been passed down for generations and has a historic history. The owners grandparents and great grandparents lived and loved this ocean home. Their children, grandchildren, and great grandchildren have spent long endless summers fishing and swimming in the beautiful beach and ocean nearby. As the owners children have grown they have chosen to share the beauty and island spirit of their family home with others. 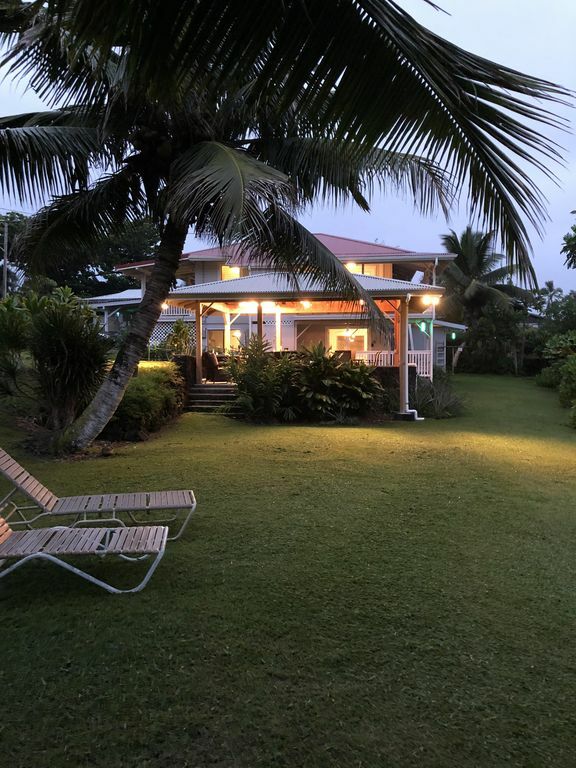 This older Kamaaina home is located close to all the beautiful island attractions, yet isolated enough to provide visitors with the morning and evening quietness and serenity they long for when visiting the islands. Couples are able to enjoy quiet evenings with ocean sounds, lush green garden views, and a beautiful night sky from every patio. Families will enjoy the closeness of the ocean cove where little ones can safely swim, explore tide pools, and collect shells and other artifacts that the ocean delivers daily on the beach. toilet, outdoor shower, Outside shower and toilet shared among all units. Upstairs: Full bath (shower/tub) Downstairs: Full bath with Shower Studio: Full bath with Shower Outdoor shower and toilet (for rinsing off after swimming at the beach) Outdoor shower and toilet shared among each unit. Primary use for showering after the beach. Condiments and spices available for guest use. Amazing beautiful home just minutes from beach. Had our family reunion in this beautiful home. It has everything you could ever need right there...towels, boogie boards, snorkeling gear, small coolers, all the kitchen wear you could ever need and do much more. This is a perfect place for a family get together...and really five star! My entire family loved their stay here at this beautiful relaxing home. The house was clean. The beds where comfortable.Everything was well thought out from the all beach accessories to the bbq area. The location was perfect to restaurants, grocery shopping and the venue for my son’s wedding. We were going to stay at a nearby hotel but my entire family said they are so happy I found this house and would definitely stay here again. We had coffee and sweet bread that was left for us every morning and sat on the porch. So relaxing. The family enjoy the beach cove. My dad mistakenly locked the keys in the house and Claudia was there within 10 minutes. 식사를 마당 발코니에서 할 수 있고 전망과 분위기가 아주 좋습니다. It was nice meeting you and your friends and providing an early check in before lunch. Thank you for choosing our beach property for your Hilo stay. While my husband did not mind going down to fix the garbage disposal after watermelon shell was put into it...there was a bigger concern from our cleaning staff who clean our downstairs unit. It seems someone brought in the Kirkland cooking spray from the grill area and thinking it might have been something else sprayed it on the floor and walls. We had to scrub down the floors and walls several times to be sure all the oil was removed which resulted in extra cleaning hours. Any suggestions on how we can better assist guests who may have difficulty when visiting would be appreciated. Truly an enjoyable vacation home. The three separate units worked out beautifully for us. The units were self sustaining so at night everyone went back to their own unit to get some good night rest. We had breakfast at the main house and have dinners at the outdoor BBQ. Everything you need is provided. The house is well stocked, provided all kitchen equipments, some basic needs for cooking and plenty of towels if you like snorkeling or swimming. Yes, it is very clean! Claudia is very responsive and can give you really good tips. Thank you for your hospitality and hope to be back soon. Rates apply for groups of 6 or more. Groups of 5 or less rates apply for 3 bedroom beach house only. Rates are based on 4 guests; add $30 per night for additional guests. Additional 2% fee may be assessed for international credit card payments.